Specialty: Specialized in comprehensive treatment combining traditional Chinese medicine (TCM) &western medicine for lung cancer, liver cancer and colon cancer etc..
Han Zhaoyu has been engaged in the clinical work of oncology for more than 20 years. He has a solid medical foundation and clinical theory knowledge and is skilled in applying it to clinical practice. He has been committed to the study in combination of TCM and Western Medicine for cancer treatments over the years. Superb medical skills and noble medical ethics have won him praise and respect among his patients and peer. 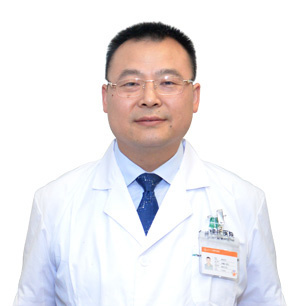 Han Zhaoyu, Master of TCM Internal Medicine (Tumor field), Member of Oncology Association of China Association of Chinese Medicine, is skilled in the comprehensive treatment of lung cancer, liver cancer, colorectal cancer, esophageal cancer, and other tumors with combination of TCM and Western medicine. He is specialized in alleviating cancer pain and has developed fibrin gel injection therapy, acupuncture points implantation therapy, autologous fibrin gel drug carrier to reduce nerve block and control refractory cancer pain. He has published more than 10 theses in national medical journals.